The Calico Cat: Hiking Beatles fan! He is so cute..and great to hear he's a Beatle's Fan! He's walking???!!!!??? Well where in the world have I been???? I have never seen anything cuter! Other than my adorable soon-to-be one year old grandson, I haven't seen any one cuter. Great job on raising a Beatles fan. Just makes you want to grab him and give him a tight hug...but then, you would call the cops. Cute picture. What a cutie. He can come over and listen to my Beatles albums any time. gosh amy, he is sooo precious! a real teddy bear of a tyke! Oh friend, that's just too cute. I haven't seen anything this adorable - and HIP! - in a long time to be honest. 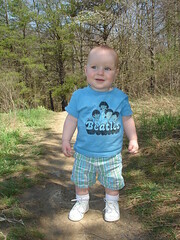 Adorable little person in a Beatles shirt...hmmm, nope, nothing cuter! nothing out there any cuter than this!